Director General Nteranya Sanginga launched another digital innovation for IITA–the IITA News app–IITA news on your mobile device. The official launch took place on 14 February as part of the inauguration ceremony of the newly renovated labs of the Virology and Germplasm Health Units. Outlining some of the functionalities of the app, Developer and Web Team Lead, Tunde Ajayi, noted that the app is easy to use and provides users regularly with fresh news about IITA. He also said the app will alert users when a new story is posted. The app reports news events as they unfold—in real time. 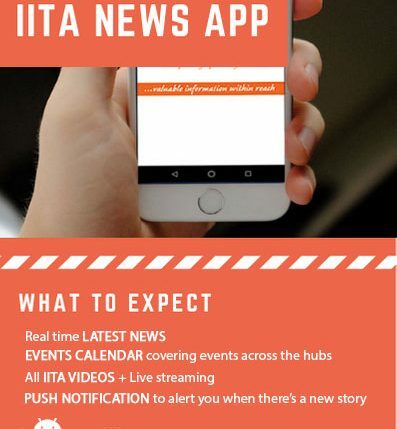 Developed by the Communication Unit, the app enables users to read stories, catch announcements, view videos, watch livestreams on the IITA video channel, and connect to information and knowledge resources, including social media platforms. Also present at the launch were Hilde Koper-Limbourg, Deputy Director General, Corporate Services; Kenton Dashiell, Deputy Director General, Partnerships for Delivery; Sylvia Oyinlola, Head of Administration, Western Africa Hub; Lava Kumar, Head of the Virology and Germplasm Health Units; and other IITA scientists. The IITA News app is now available for immediate download from the Google Play Store.